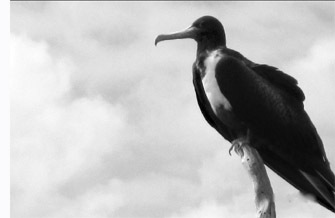 Found throughout the Caribbean, the ubiquitous Frigate Bird is no stranger to Long Caye. One can see them everyday without fail, soaring above the island on updrafts created when the trade winds hit the island. They are aerodynamic birds, the best fliers of any local birds we see, with their distinctive swept back, long narrow wings. 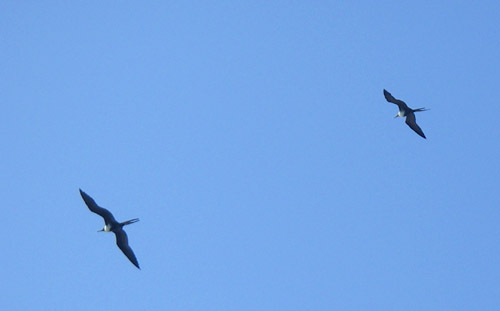 Frigates are so good at soaring that we seldom ever see them take a wing beat. They seemingly can float forever and soar on the smallest updrafts of wind. 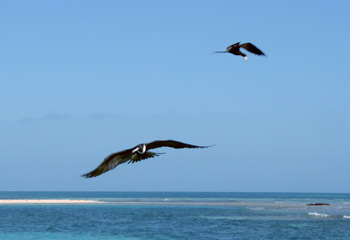 We seldom, if ever, see Frigate Birds land or roost on our island. We know of several rookeries inside the barrier reef where they nest, but we don’t know if they actually return there each night. It still is a mystery to us where our ‘flock’ of frigates spend the night. Frigate Birds are also known as ‘Man of War’ birds, both names having been derived from mariners in the early days of sailing ships. The names come from the habits of the birds, who attack (like the old, fast frigate class of sailing ships, and man of war ships) and steal food from other sea birds. Frigates are so adept at flight that they swoop down on other birds whom they see catching fish, and through attacks and harassment the other birds eventually disgorge and drop their freshly caught fish, which the Frigates then scoop up. We see Frigates attack gulls, terns, pelicans, and even the ospreys, although the ospreys hold their own since they are quite heavily ‘armed’ themselves. So, bird life on the island is never boring as we watch the drama unfold daily with the Frigate Birds holding all the others under their control. We also can watch the up close Frigates when scoop up some of our compost leftovers from meal prep, such as chicken parts, which we toss over our seawall. If you wish to do some Belize birding, travel to Belize this winter! The birding is best during the month of April! ← Great Long Caye, Belize picture!